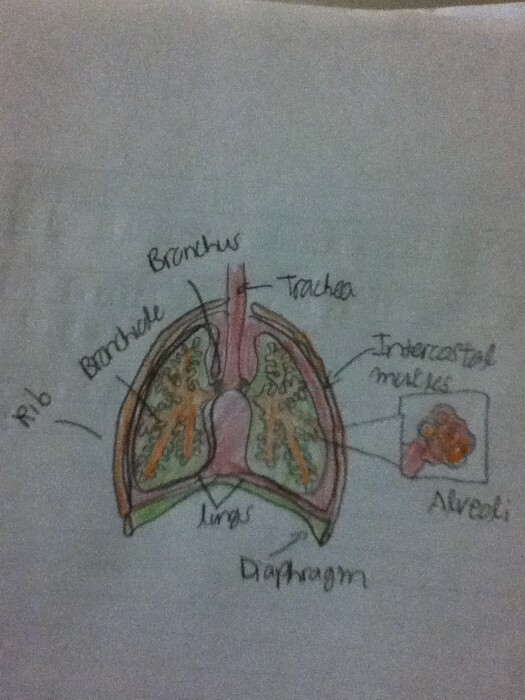 Even though alveoli are so small there are huge numbers of them which results in a large surface area for gas exchange. Also the wall of the alveoli is made up of a single layer of thin cells and so are the capillaries, this creates a short diffusion distance for the gases. Therefore this allows rapid gas exchange. The alveoli are covered by a dense network of blood capillaries which have a low oxygen and high carbon dioxide concentrations. This allows oxygen to diffuse into the blood and carbon dioxide to diffuse out of the blood. Finally, there are cells in the alveolar walls which secrete a fluid that keeps the inner surface of the alveoli moist, allowing gases to dissolve. This fluid also contains a natural detergent that prevents the sides of the alveoli from sticking together. 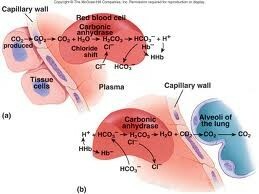 Oxygen in picked up in the lungs by hemoglobin which is found in red blood cells. The hemoglobin then transports the oxygen (4 oxygens can be carried at one time by one cell) to cells that need it and when they release the oxygen, they pick up carbon dioxide. They then carry the carbon dioxide back to the lungs where most of it is exhaled. the whole process is mediated by chemical triggers in the body. The 1st major one is Cystic fibrosis. Cystic fibrosis is an inherited disease that affects the secretory cells lining the lungs, pancreas, sweat glands, and salivary glands. The defect produces an abnormal transport protein, resulting in decreased chloride ion secretion out of cells. Normally, the diffusion of chloride and sodium ions out of the cells causes water to follow by osmosis. In the lungs, the water forms a thin fluid layer over which mucus is moved by ciliated cells. In cystic fibrosis, the decreased chloride ion diffusion results in dehydrated respiratory secretions. The mucus is more viscous, resisting movement by cilia, and it accumulates in the lungs. For reasons not completely understood, the mucus accumulation increases the likelihood of infections. Chronic airflow obstruction causes difficulty in breathing, and coughing in an attempt to remove the mucus can result in pneumothorax and bleeding within the lungs. Once fatal during early childhood, many victims of cystic fibrosis are now surviving into young adulthood. Future treatments could include the development of drugs that correct or assist the normal ion transport mechanism. Alternatively, cystic fibrosis may some day be cured through genetic engineering by inserting a functional copy of the defective gene into a person with the disease. Research on this exciting possibility is currently underway. 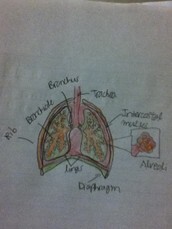 The 2nd main one is Emphysema. Emphysema results in the destruction of the alveolar walls. Many individuals have both bronchitis and emphysema, which are often referred to as chronic obstructive pulmonary disease (COPD). Chronic inflammation of the bronchioles, usually caused by cigarette smoke or air pollution, probably initiates emphysema. Narrowing of the bronchioles restricts air movement, and air tends to be retained in the lungs. Coughing to remove accumulated mucus increases pressure in the alveoli, resulting in rupture and destruction of alveolar walls. Loss of alveolar walls has two important consequences. The respiratory membrane has a decrease surface area, which decreases gas exchange, and loss of elastic fibers decrease the ability of the lungs to recoil and expel air. Symptoms of emphysema include shortness of breath and enlargement of the thoracic cavity. Treatment involves removing sources of irritants (for example, stopping smoking), promoting the removal of bronchial secretions, retraining people to breathe so that expiration of air is maximized, and using antibiotics to prevent infections. The progress of emphysema can be slowed, but there is no cure.